Decorated by ivory removable satin bows. Large scallop pattern with droplet shape pattern. Sole is hard synthetic non slip material. 100% Handmade in Spain by TNY Shoes or Tinny Shoes for Cachet Kids. 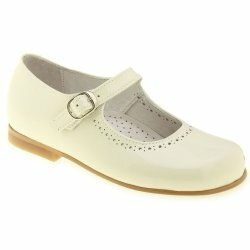 These ivory patent shoes are for special occasions use only and not suitable as school wear. Please unbuckle before taking off the shoes to avoid damaging the strap.